Source: International Committee for the Freedom of the Cuban 5, 23 June 2011. We were more than a little surprised when a CNN journalist based in Los Angeles contacted SPARC Gallery interested in covering Gerardo Hernandez’s exhibit “Humor from my Pen” before its opening on June 4. We remained skeptical but after several phone calls back and forth an interview was set up. On June 3 the CNN journalist arrived early to set up her camera and to go over what she would be covering about the background of Gerardo’s work and the case of the Cuban 5 in general. She seemed genuinely interested and did a long interview with the organizers from the International Committee for the Freedom of the Cuban 5 in both Spanish and English. She also interviewed the Executive Director of SPARC, Debra Padilla. We did not know going into the interview just how much the journalist knew about the case of the Cuban 5 but after more than 3 hours she learned not only about the artistic talents displayed in Gerardo’s cartoons but also about the deep injustice that he and his four brothers have been enduring for 13 years for defending their country, Cuba, against terrorism. We asked the journalist how long it would take before we would know if the interview was going to be aired and she told us she did not know but mentioned that her editor wanted to find someone with a different “point of view” to “balance” the story. Our surprise about the interview was even greater when we were told that the “balanced” segment was complete and going to be aired on a program of CNN called “Encuentro” on Wednesday June 15 at 2pm PST. We immediately passed this new information along to many of our friends so they could see with their own eyes that after 13 years of silence we were going to get a little break on coverage of the Cuban 5. Unfortunately it did not happen. The best answer we were able to get from the journalist who did the interview was that it was an “executive decision” not to air the segment. So many times we hear about freedom in the United States with a free media that covers all points of views; but in the end it is those at the top of the media chain of command who will determine what is news and what isn’t. Perhaps CNN was having trouble glossing over the courage of the Cuban 5 in the war against terrorism, or to show them in a human light. Perhaps they could not find a way to deny that these sons of Cuba were extraordinary men sent to Miami to defend the sovereignty of their country. Or maybe they were nervous about the absolute double standard in the US where an admitted terrorist like Luis Posada Carriles can show his paintings in Miami while the Cuban 5, who were here to prevent terrorism, produce art behind bars. With typical journalistic hyperbole you claim that changes to the employment structure in Cuba amount to ‘a structural adjustment so harsh it would make even advocates of the “shock therapy” meted out in the former Soviet bloc wince’ (John Rathbone and Marc Frank, ‘Cuba Libre?’ 25 April 2011). You are mistaken. The Sixth Congress of the Cuban Communist Party (CCP) took place in Havana between the 16 and 19 April 2011, marking the 50th anniversary of two historic events: the declaration of the socialist character of the Cuban Revolution on 16 April 1961 and the defeat of the Bay of Pigs invasion by CIA-trained Cuban exiles, within 72 hours, on the 19 April 1961. The five Cubans are political prisoners held in US gaols for trying to stop terrorist attacks against their country. They were working to foil the persistent attempts by right-wing counter-revolutionary groups based in Miami to commit acts of sabotage and terrorism against Cuba. Among those they attempted to expose was Luis Posada Carrilles, who has openly admitted to terrorist acts including the bombing of a Cuban aeroplane in 1976 which killed over 70 people. However when they submitted information to the US government which would have helped prevent further terrorist action they themselves were arrested on trumped-up charges, sentenced in a Miami courtroom and have been held in US gaols since, including spells in solitary confinement, while terrorists like Posada Carilles walk free on US soil. The Cuban five were falsely tried, free the Cuban five! Contact us to get involved in our work in solidarity with the Cuban revolution and against the imprisonment of the Cuban five. Photos: Carlos Serpa Maceira (top) and Moises Rodriguez (bottom) are congratulated in their respective areas by neighbours who have just watched the television programme Pawns of Imperialism on Saturday 26 February. The spontaneous demonstration which broke out on Saturday night in Nueva Gerona, capital of Cuba’s Island of Youth, was not the anti-regime uprising for which the US government, bourgeois media, and the internal opposition hopelessly craves. Instead it was a celebration of the revolutionary commitment shown by local resident Carlos Serpa Maceira, as neighbours welcomed him back into the arms of his people. Fight Racism! Fight Imperialism! that marked the 50th anniversary of the Cuban revolution in 2009. The articles analyse different aspects of the development of socialism in Cuba: from health and education, to economic management and Cuba’s trade and cooperation agreements with progressive Latin American and Caribbean governments. The pamphlet is free to download here and we encourage you to share it widely. Hundreds of revolutionaries take to the streets to protest at a parade by the ‘Ladies in White’ on 21 March 2010 shouting slogans against the European Union at Volker Pellet, deputy head of the German embassy, and Michael Upton (R), deputy head of the British embassy. These diplomats were violating the principle of non-intervention and non-interference by supporting the ‘Ladies’ who have publicly admitted being funded from the US. In this time of global economic crisis people’s livelihoods are being attacked while bankers boast of their bonuses. Politicians compete in an electoral fraud to cover up savage cuts in health, education and social services. While British government complicity in torture is repeatedly exposed and the bloody imperialist occupation in Afghanistan intensifies, the BBC has dedicated its resources to focusing on group of less than 30 Cuban women, known as the ‘Ladies in White’, protesting against supposed human rights abuses in Cuba. Why is this? On Saturday 10 April 2010 you addressed a plenary session of the Society of Latin American Studies annual conference in Bristol, speaking as a member of the British government; Minister of State for Europe and Parliamentary Under-Secretary of State for Foreign Affairs at the Foreign and Commonwealth Office. One of the attendees asked you to explain why Michael Upton, deputy head of the British Embassy, in Havana had been participating in demonstrations by the ‘Ladies in White’, in contravention of the United Nations Declaration on the Inadmissibility of Intervention and Interference in the Internal Affairs of States, Resolution 36/103, 91st Plenary meeting, 9 December 1981. The Ladies in White have protested monthly for seven years without interference or restrictions being placed on them by the Cuban state, its agents or its citizens. Recently, in a televised interview, their leader Laura Pollan admitted having received external funding. This money comes from Santiago Alvarez, a Miami-based Cuban exile, who has been linked to terrorist actions against the Cuban people. In November 2006 he was sentenced in the United States to nearly four years in prison for his part in a conspiracy to stockpile weapons for possible use against Cuba. Alvarez is also a key sponsor of the terrorist Luís Posada Carriles who has boasted about his part in the bombing of a Cuban commercial flight in 1976, which killed all 73 people on board. Your initial response to the academic who raised the question was to claim that you could not see any problem with diplomats participating in demonstrations in their host countries. This suggests an alarming lack of knowledge about the international principle of non-intervention and non-interference, particularly given your governmental responsibilities. However, when the Ambassador of the Venezuelan embassy in London, with whom you shared the platform, affirmed this principle contained in Resolution 36/103, you agreed to investigate this extremely serious matter. We are therefore writing to request an immediate investigation to determine why British diplomats are violating the terms of their post. 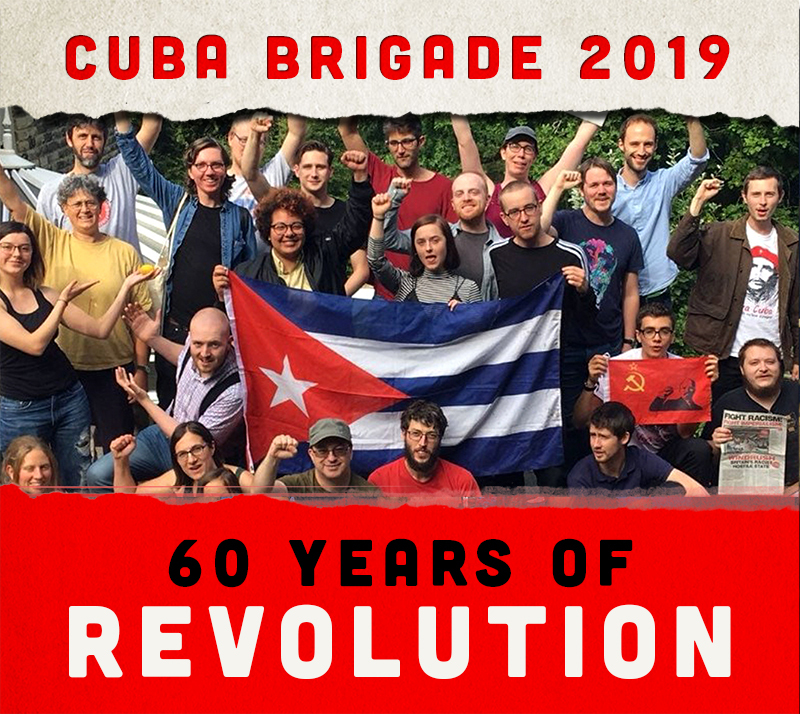 We are asking all supporters of socialist Cuba and Cuba's right to self-determination to write to Chris Bryant at email address provided - or post the letter above as soon as possible.